In Module 7, students build upon their knowledge of measurement as they relate multiplication to the conversion of measurement units. 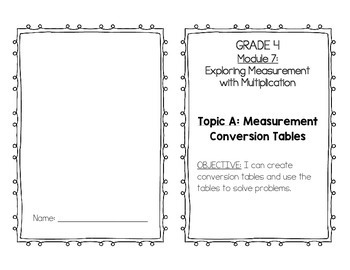 Throughout the module, students explore multiple strategies for solving measurement problems involving unit conversion. In Topic A, students explore measurement with multiplication. 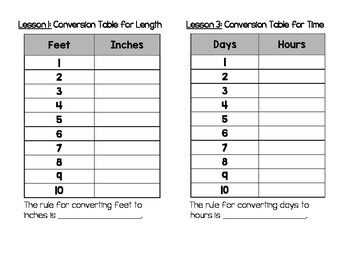 This booklet allows students to create measurement conversion tables for weight (pounds to ounces), length ( yards to feet, feet to inches), capacity (gallons to quarts, quarts to pints, pints to cups), and time (days to hours, hours to minutes, minutes to seconds) using their multiplication skills. 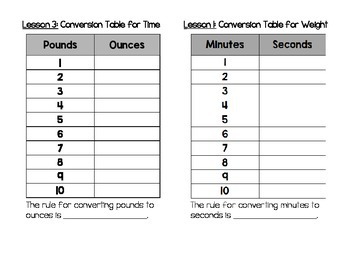 Students then use their measurement conversion tables to practice and solve multiplicative comparison word problems. 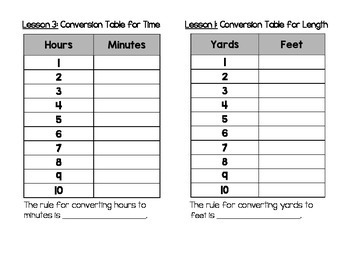 Students continue to utilize their conversion tables throughout Topic B to add and subtract mixed units of capacity, length, weight, and time.